We’d love your help. 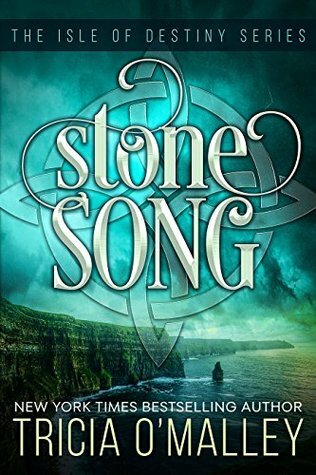 Let us know what’s wrong with this preview of Stone Song by Tricia O'Malley. A cen From New York Times Bestselling author, Tricia O’Malley, comes a riveting new magickal romance set in modern day Dublin. To ask other readers questions about Stone Song, please sign up. As an avid reader you find books you like, some you love. Every so often you come across a book that not only is amazing and brilliant but touches your heart and soul. This book is that book. The book that makes you feel , inserts you into the storyline and touches your heart. This book is about true love, friendships, trust, finding and believing in your self. It has mystery, supernatural aspects, Irish mythology and a quest for good vs. Evil. This book reminded me of a combination of Karen Mar As an avid reader you find books you like, some you love. Every so often you come across a book that not only is amazing and brilliant but touches your heart and soul. This book is that book. Cheesy. Flat characters. Underdeveloped world. I tried this one in audio and the narration didn't work for me. The American accent for parts of the story, then switching to an Irish accent for the dialogue was jarring and kept throwing me out of the story. Also, when the dialogue was occurring, the narrator spoke extremely slowly. I had to speed up the playback to get past it, but it wasn't perfect. I think I will skip this one in audio and try again in print. Very enjoyable, good lead characters. Love the descriptions of the countryside. Interesting and solid story. Can't wait for the next one. 2.5 stars. My god was this cheesy. For some unknown reason, I'm feeling compelled to read the next one though, hence the extra 1/2 star. Her tequila series is 1000x better. Stick with that one, people. I love the fact that she started a whole other series which includes the characters of the "Cove" series. I'm fairly certain I finished all of the cove series and Stone Song all within a week of starting to read Tricia, (That's a book a day). Imagine my disappointment when I finished Stone Song, saw that "Sword" was supposed to be available in the fall of 2016... it is not out yet. I'm anxious for it and the 3rd book too - so - - chop, chop - get to writing Tricia! Your fans eagerly await! This review is of the audiobook. It seemed a little immature to me. The narration by Amy Landon distracted from my enjoyment of the book. The switching back and forth between American and the Irish accent didn't work well. They should have found an Irish narrator. I doubt if I will continue with the other books in the series. So the magic continues, yeah! I am so happy that the journey of Grace O'Malley's lineage continues in this new series. Tricia O'Malley has a way of going straight to your heart with her characters. The only problem I have is that I can't stop reading once I start, this has led to a very anxious dog dancing around me to take her out. I found this very choppy. The main character, supposedly on a “quest”, did very little to accomplish that task. Seemed like they just wandered around a lot. Wonderful characters and good story line. I like stories with a quest to them they have to figure out. I was surprised by the ending, both where the stone was found and their visit to the cove but I enjoyed every bit of the story and discovery of magic. I wish I had a touch of magic sometimes but don’t want to fight supernatural creatures so I guess I’m happier without it. LOL! Good read and I’ve already downloaded the second book in the series. Love a good tale told well. I loved this book and all the characters! I also love how this series links up with The Mystic Cove series, because that was my favorite series, although this one is running a close second. There's drama, romance, humor, magick and mystery all rolled up into one awesome, amazing, excellent book. I really can't express how awesome this book is and how much I loved it. A must read, in my opinion. I did receive a copy early in exchange for my honest review. I loved the storyline. I loved the characters. I loved the lighthearted banter. I loved the close friendships that became more like family. I loved that they were able to work, fight and laugh together. My only complaint is that I desperately wish the book was longer. I’m off to read the other books in the series and hope they make me just as happy as I read them! Love and Stones, both strong. Beautiful descriptive scenery, strong characters, love and magick; wrapped up in four fearless friends on a quest. Ms. O'Malley describes Ireland with love for the land that gives this reader a strong desire to travel there and see it for myself. As Claire ventures on her quest, she learns who and what she is as well as what she's made of. Excellent book. Absolutely wonderful! Another fantastic book by Tricia O'Malley. I loved the Mystic Cove Series! The Isle of Destiny Series is looking to be just as wonderful. I love how some of the characters from the first series are showing up in this one! Perfect mix of adventure fantasy and romance. I would recommend Nora Roberts fans give Tricia O'Malley a try. I didn't realize that this book would tie into the Mystic Cove series that I just finished by Tricia O'Malley. I would say that I enjoyed the Mystic Cove series more and would go that route if you were to pick one of the series to read. That being said it is still a romance set in Ireland so not bad. I thoroughly enjoyed this novel. A little slow starting up but rich with Irish Mythology. Clare, Blake, and Bianca are strong characters with quirks that left me smiling. The dialogue held me tight with rich flavor and rhythm so unlike American West Coast pacing. While Stone Song sparked my interest at times, it was much too underdeveloped to be a good book. The plot unfolded in the blink of an eye, leaving no room for the characters to feel real, or the world saving task they faced to be fleshed out. Completely forgettable. Will not be continuing on with the series. In terms of story line and creativity, this book gets 5 stars from me. But the writing seemed like it was geared toward a MUCH younger crowd, and it drove me crazy, so For that, I give it a 1. Decided to compromise with a 3 star review! Tricia O'Malley creates wonderful characters then she spins the most wonderful story around and through them. You have to keep reading you have to know what happens. Pick up and read this book. Start the series and keep reading. Glad it brought characters in from the other series. I was holding off reading this book until more books came out. I enjoyed reading this new chapter in the family. I can not wait to start the next book. O love the relationships of the 2 friends, and then the 4 as they travel together the attraction between Claire and Blake was a little blackened but still goo. I love happy endings! I first started reading this authors Wild Irish series and was so very pleasantly surprised to get hooked on her writings so fast. Now I can hardly wait for the next book! Very good, very fast read, only because I didn't want to put it down. I enjoy reading a book when I have a good description of the characters. Very likable and real characters. I'm on to the next Tricia O,Malley book. I enjoyed not just the plot but the descriptions of villages, beaches, mountain and craggy bluffs over the ocean. Made me want to visit Ireland. Loved the characters too! Ready for next book! Able to escape with the story. Developed characters, enough of story leading one on to need to finish the ending. Glad is series. Didn't really know what to expect but once you start getting into it I was in book line and sinker.. Enjoy your book. I truly enjoy these books and recommend this author highly. A bit of fantasy and love woven into tales of Ireland made this book especially enticing. New York Times Bestselling author, Tricia O'Malley, lives in the Caribbean with her much doted-upon dogs, Briggs and Blue. On a typical day you will find her lost in the worlds of her making or gearing up to go scuba diving. Tricia loves fun vacation reads, hates wimpy characters, and hosts a serious addiction to traveling the world. She finds inspiration on the go – and you’ll often find her book New York Times Bestselling author, Tricia O'Malley, lives in the Caribbean with her much doted-upon dogs, Briggs and Blue. On a typical day you will find her lost in the worlds of her making or gearing up to go scuba diving. Tricia loves fun vacation reads, hates wimpy characters, and hosts a serious addiction to traveling the world. She finds inspiration on the go – and you’ll often find her books set in beautiful settings with characters tangled in affairs of the heart…or murder.